If you're looking for a gentle introduction to personal training, a boost to your current exercise routine or just prefer to train in a group environment, then our small group personal training sessions could be for you. You can attend between 1 and 3 group personal training sessions a week and there are never more than 6 people in a class. This allows us to keep a personal touch to the training and means you never feel neglected or forgotten. Every exercise is adaptable to your current fitness level and abilities so you never need to worry about how fit or unfit the rest of the class is. It's also a lot of fun training with a group of like-minded individuals. 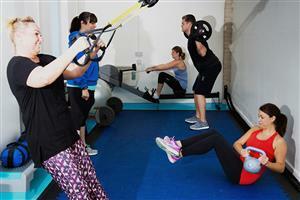 During these personal training sessions, we use a range of equipment such as kettlebells, TRX, barbells and dumbbells. We also do bodyweight exercises such as push ups and pull ups. The format of the classes is usually based on circuit training as this allows everyone the opportunity to use each piece of equipment and to work to their own abilities. No two classes are ever the same and we aim to make them as enjoyable as possible. 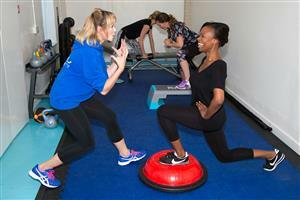 We hold our group training classes from Monday to Saturday in Nottingham and Chelmsford. The classes are at a variety of times and you can find full details on the Nottingham and Chelmsford timetable pages. Our group sessions work well as an addition to an individual personal training package and we offer a 5% discount to clients who opt for both. Check out our prices or contact our Nottingham or Chelmsford teams for more information. We offer a free trial class to anyone thinking of signing up for group personal training so please get in touch if you’d like to book one. Gemma makes the sessions fun and has this knack of pushing me to do more. The Accelerator Programme has allowed me to get fitter by being healthier! My mindset has been quite clear since joining the sessions and i have completely cut out refined carbs from my diet, eating mainly salads and veg such as sweet potato. I never miss breakfast now and though it sounds simple, I am having 3 healthy meals, which probably hasn’t always been the case. I have made a conscious effort to drink more water! Gemma makes the sessions fun and has this knack of pushing me to do more, be it by increasing weights or just catching me at that last bit where motivation is lacking. It’s all good fun and I feel all the better for it. One month in and I'm already feeling healthier and happier! One month in and I’m already feeling healthier and happier! I was a little nervous at the start of the Accelerator Programme because I wasn’t sure what to expect. It was tough to start with but now I am really beginning to enjoy the experience. I have already noticed my fitness and energy levels have increased, and my range of movement and flexibility have also improved. One of the best things about the programme is being able to train and have fun alongside a group of fantastic people who can and do motivate each other with the help of some great trainers. I’m looking forward to the rest of the programme. Every session varies which makes it loads of fun! I am one month into 3 per week personal training sessions and already feel healthier, and loving the sessions! I have always enjoyed attending fitness classes at gyms but would lose interest after a while due to the same routines or the copious amount of people in classes. Thankfully I discovered Kristy Ellis Personal Training because the classes are limited and every session varies which makes it loads of fun (with laughs sprinkled in). The trainers are great at motivating and keeping us focused on our personal health goals. Due to the positive results and benefits I’ve seen in a month, I am eager to continue my journey of becoming healthier! I love attending the group sessions. I love attending the group sessions. I personally find it more motivating and a lot more of a fun way to exercise. Although I am a frequent jogger, I needed something else to help increase my fitness and strength, and to tone. My sessions have definitely done that - I can see a huge difference in myself and I have to thank Gemma, Tiff and Natalie for that. I never used to know what exercises to do at home or even how to use weights. Now I own some weights, have a medicine ball and even occasionally do the 1000 reps workout at home. On the days I'm not training at the studio I actually wish I was! I've enjoyed the first few weeks of the programme so much that on the days I'm not training at the studio I actually wish I was! I'm getting married in August so with the wedding now nine weeks away I had no doubt that I wanted to do something to kick start my body and get toned up as much as I physically could in nine weeks. I already feel like some areas are toning and looking smoother, which is brilliant after only three weeks! Of course, diet is a huge part of this too and I've changed the foods I eat using the food guide given to me by Kristy. There are some delicious healthy recipes out there. Because of what I'm eating, I no longer feel sluggish, just energised! Brilliant programme, thank you! I started training with Kristy and the team at the beginning of June and am delighted that I signed up to the Group PT. My goals were to feel fitter, stronger and more flexible and every week I've noticed an improvement in all three areas as well as a boost in energy. I'd definitely recommend attending a group session; everyone has been really friendly and supportive and never intimidating. It's the first time I've tried personal training and love the fact that they take care of the exercise planning, allowing me to concentrate on working hard and following instructions safe in the knowledge that I'm in expert hands. I'm so happy with my results so far and I am looking forward to seeing greater results. I was a bit nervous joining the programme to begin with as I hadn't worked out in a very long time and wasn't sure what to expect. However, I'm glad I did as I really enjoy it. After the sessions I feel great even though each one gets harder and not easier. Working in a group keeps me motivated though. I'm so happy with my results so far and I am looking forward to seeing greater results, especially with all the support I have received with my food plan and workouts from Kristy and Gemma. Thanks. All the other members of the group are great! I was reluctant at the start of the programme as I was afraid everyone else would be so much slimmer and fitter than me. After the first sessions (although I was in pain) I wondered why I hadn''t joined earlier. Kristy is so encouraging and has a great way of making me work harder. All the other members of the group are great and I actually look forward to the sessions. I am feeling fitter and really noticing the results in my clothes. I really look forward to my sessions. They work me really hard but the results are showing. I love the group sessions and we always try and have a laugh. When I started going through the menopause my waist was getting bigger and I thought, OK it's middle age spread and I've got it for the rest of my life but 7 months of hard work and I have my waist back again. I feel the strongest and fittest I've ever felt, and I love it. All of the instructors are really friendly and super encouraging. For years, I was “too busy” to exercise or go to the gym. My weight crept up and I felt heavy, unfit, and I just didn’t like the way I looked. Despite wanting to get fit, I felt too unfit to do anything about it! Money got wasted on gym subscriptions when I didn’t feel comfortable in that environment. The Accelerator Program has been brilliant. I’ve already seen results in my first month, losing a total of 11.5cm! All of the instructors are really friendly and super encouraging. My confidence has really been boosted. Working in small groups is great as everyone has a great laugh and we all spur each other on. I’m really looking forward to my next few months to see what results they bring! Kristy is a great motivator and personal trainer. She is always so supportive and encouraging and really celebrates the triumphs with you. I never thought I'd enjoy exercise like I now do. Kristy has shown me that it's fun and with perseverance and hard work exercising and controlling what you eat it can make a difference. The group sessions have been great and I can honestly say I am enjoying them and will continue. I have made some great friends and together we help inspire each other. I'm now finding time to exercise on my own which is a first for me! And I feel committed to continuing with my personal goals to being where I want to be. Thanks, Kristy!